More than ever, the ethics and standards that we teach at CJC are critical underpinnings for professional communicators. Rather than feeling daunted or dismayed, we are reinvigorated by the opportunities to take a prominent leadership role as change challenges truth and trust. And we are particularly excited about the addition of 15 new faculty positions funded by the University and supplemented by generous donors, which allowed us to hire top talent. We expect to hire even more faculty positions this year, perhaps as many as 10. This unprecedented infusion has not only allowed us to reduce a high student-to-faculty ratio, it exposes our students to new thinking, new skills development and new immersion opportunities. In this section of our Anniversary site, you can read how our academic leaders are evolving their curriculum and approaches to learning as the industries we serve and higher education itself changes. In addition, the College will be focusing on four core initiatives. Providing World-Class Immersion Venues. Our College already provides, arguably, the most extensive student immersion opportunities of any communication program in the country. We will continue to invest in new technologies, new space and new professional expertise to ensure our students will have the necessary skills not only for today’s media world, but also for a changing landscape four or five years from now. Leveraging Technology to Improve Communication. Our Media Effects and Technology Lab is already exploring how virtual reality and artificial intelligence can have a meaningful impact on more effective messaging. We have one of the largest data journalism and coding programs in the country, and will look to expand our data analytics research and curriculum. And we will continue to experiment with using gaming technology, social media and other emerging devices and platforms to help our industries prepare for the future. Building a More Robust Career Continuum. Our role in preparing unmatched talent does not start and end at Weimer Hall. Our responsibility extends to generating excitement in high school students, particularly those from underrepresented groups, for communication industry careers. We need to invest more in career placement, including building stronger networks to potential employers, and mentoring programs between students and alumni. And we need to strengthen support of our graduates as they navigate their careers. Restoring Trust in Media and Technology. It is an undisputed time of crisis for the media and American society, due to the decline of “objective facts and rational discourse.” All institutions are suffering historic lows in public trust, with media suffering the most serious deficit against the backdrop of fake news, hyper-politics and news organizations veering farther away from impartiality. We think this presents us with a golden opportunity to focus on this topic of significant public concern. With a grant from the News Integrity Initiative, we convened a summit on building trust in June that assembled scientists from adjacent disciplines, including psychology, anthropology, sociology and neuroscience, as well as communication. We believe that this is our chance to build a coalition of academics and practitioners who can explore the deterioration of trust in our society and recommend ways in which institutions – particularly social media networks and distribution platforms like Google and Facebook — can enable the public to be more discerning arbiters of truth. We need endowed chairs and professorships to supplement faculty salaries and provide more research funding. This will enable us to attract the best and brightest in our field. Among our new faculty positions is the Michael and Linda Connelly Lecturer in Narrative Nonfiction and the Rob Hiaasen Lecturer in Investigative Reporting, gifts that allowed us to hire two renowned journalists. These are great examples of how a larger compensation package can be transformative. We need to upgrade and expand our building, a deficit cited in our accreditation report. With a few additions to our building over the next several years and projects such as climate-controlling our atrium, we can extend the life of Weimer Hall. One of the things holding us back from being number one, as I alluded to earlier, is career placement and average starting salaries. 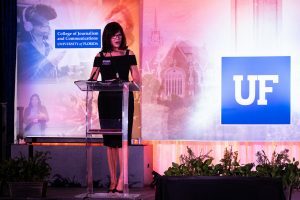 One of my top goals for the next year is to raise the money to assemble a team, working with UF’s Career Connections, that is focused on our disciplines and on nurturing an employer network in ways that make CJC a hot spot on the employment radar. One of the first steps will be data collection, because our tracking today is spotty. When I was a student here, back before the invention of modern technology, all it took to prepare us for rewarding careers were a bunch of Royal typewriters, a few darkrooms and a studio with a couple of cameras. Today, the proposition is much more complex. We must chase rapid-fire developments in technology, address the dramatic evolution of consumer behavior, prepare our students to be fluent in all things digital, and engage in experimentation around the media of the future. What hasn’t changed, though, is our everlasting mission to ensure that our students are grounded in the fundamental principles and practices that enable them to do right by society.